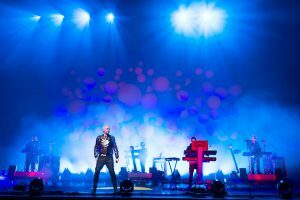 As well as singing some songs at the London 2012 Team GB athletes’ parade today, the Pet Shop Boys have a busy week ahead. Having previously trailed the release with the suitably Olympic ‘Winner’, Chris Lowe and Neil Tennant release their 11th album Elysium. Digital Spy recently sat down with the duo, and we spoke to them about the Olympics, One Direction, and just why the record labels have always tried to kill the single. What was it like to play the Olympics Closing Ceremony? Like George Michael! Was that an option for you? One Direction were on just after you – what did you make of them? Neil: ‘I quite like One Direction’s records. I think they’re really good popstars. They seem to be very big. Being a popstar you have no idea how much hard work it is. When we first started we used to do all the teeny stuff but One Direction worked. Elysium is the first album you’ve made in the US – why is that? How different was he to work with? Are you fans of hip-hop generally? Neil: ‘When we started in the early ’80s one of our main influences was the emerging – it wasn’t even called hip-hop then, it was called rap – ‘West End Girls’ was meant to be a rap like Grandmaster Flash’s ‘The Message’. It is that same rhythm – literally. We used to listen to quite a lot of that. That’s a great record – and that’s very different. Is ‘Ego Music’ on the album about anyone in particular? And ‘Your Early Stuff’ – is that about you? Do you feel you have to live up to your early stuff? Yes sold well and you won an ‘Outstanding Contribution’ Brit – did that bring any pressure from EMI? Neil: ‘Most people can’t be arsed! Actually, most people aren’t that prolific…What we really do now is CD singles that become digital bundles. When we said we were releasing the CD single of ‘Winner’, EMI sort of chuckled, thinking, ‘When was the last time we did one of those?’ Actually Blur’s was available… we think that’s a great format. You buy the CD, it’s got the track and then three other ones. How great. It should cost £2.99. There’s been talk of EMI selling off Parlophone – is that stuff you get told about? When GaGa does anything it’s on the front page it seems – what do you think of her as an artist?